As he faces a major corruption probe, Ecuadorian President Lenin Moreno has met another demand from Washington by booting WikiLeaks journalist Julian Assange out of Ecuador’s embassy in London. Times were different when the WikiLeaks founder walked into Ecuador’s London embassy seeking asylum in 2012. Ecuador agreed, granting him asylum on the grounds that his “life, safety or personal integrity” could be compromised at any moment. Having also kicked US troops off its soil just a few years earlier, the tiny South American nation’s gesture was applauded by many, including domestically. Fast forward seven years, and Ecuador has now handed him over for almost certain extradition. The country’s former consul general in London says the move is not only unwarranted but also illegal under international law. “This is a violation of the right and the institution of asylum,” Fidel Narvaez told me. For Narvaez, who was among the Ecuadorian officials who received Assange in 2012, the move is part of a return to a “subservient” foreign policy by the Ecuadorian government under Lenin Moreno. “The foreign policy of the Ecuadorian government changed dramatically and it is now completely subservient to foreign pressures, especially from the US and the IMF, as it always was before the Citizen’s Revolution,” Narvaez adds. In recent months, Moreno’s government has restored a controversial fly-over program in the country with the US military, and also participated in the creation of the right-wing-led Prosur bloc as a measure to dismantle the Union of South American Nations created by Correa and allies such as the late Hugo Chavez. The Ecuadorian leader inked a $4.2 billion loan with the IMF, after spending months claiming Correa had driven the country into historic debt. In light of these and other measures, Moreno’s move against Assange isn’t surprising, but the timing of it is about more than just appeasing his allies. “They want to use Julian Assange as a scapegoat to distract from the INA Papers scandal,” says Narvaez, referring to the allegations of corruption that have sullied Moreno, his family and other close associates. The Ecuadorian president is facing a political investigation over accusations of money laundering through offshore accounts and shell companies in Panama, including the INA Investment Corp, of which Moreno’s brother was the registered owner. Documents obtained by an opposition lawmaker, as well as damning images and documents circulating on social media that were apparently hacked from Moreno’s telephone, have irreparably tarnished his image and his credibility as anti-corruption campaigner. Approval ratings for Moreno have since plummeted, and only 17 percent of Ecuadorians say they believe their president. Predictably, his party was punished at the polls in the country’s recent municipal elections, losing two-thirds of the territories they won previously. Risks of his impeachment are also growing. In what can only be described as a desperate attempt to divert attention, Moreno and his officials accused Assange and WikiLeaks of orchestrating the scandal. Communications Minister Andres Michelena went as far as to claim that Assange was colluding with Correa and Venezuelan President Nicolas Maduro to ‘destabilize’ Ecuador’s government. Narvaez, who made headlines after issuing a “safe pass” for NSA leaker Edward Snowden to travel to Ecuador to seek political asylum in 2013, says Assange has not broken any rules and the claims are merely pretexts to end his asylum. Moreno’s decision to ‘withdraw’ asylum is nonetheless dubious, and might still face a number of legal challenges given various significant developments in the last few years. Assange has won favorable verdicts at the United Nations and the Inter-American Commission of Human Rights asserting his freedom, and he is no longer wanted for questioning in Sweden. Moreover, Assange is now an Ecuadorian citizen, and the country’s constitution prohibits the government from allowing an Ecuadorian to be extradited.Moreno’s ‘suspension’ of Assange’s citizenship certainly has no precedent let alone basis, and a challenge in the courts could force a reversal. Given the state of affairs in Ecuador, these might all just be formalities. Impeachment or not, Moreno has long been rumored to be preparing an early exit and his right-wing allies appear poised to take over the helm in the Carondelet Palace. Nevertheless, his crusade against Correa’s Citizen’s Revolution has meant a dismantling of institutions and regulations, coupled with austerity measures that have included massive public layoffs. 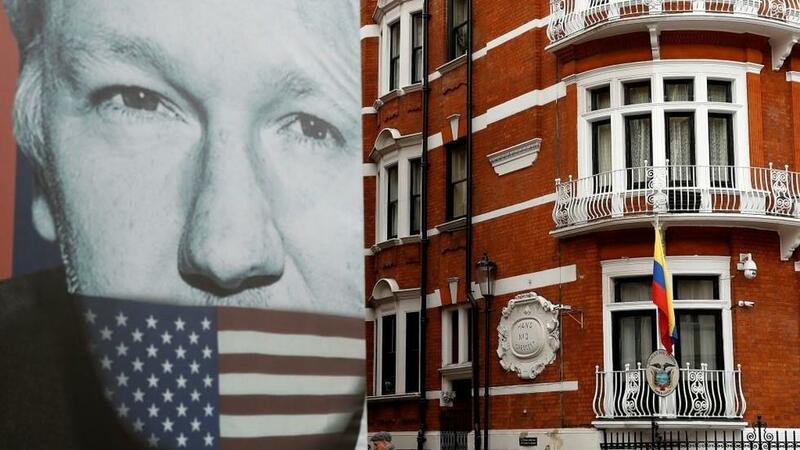 The country finds itself spiraling towards the political instability and disarray that characterized the Andean nation during the 1990s and early 2000s, and therefore laws and process may be insufficient to stop the extradition of Assange’s after his forced exit from Ecuador’s embassy. Assange is trapped in this Kafkaesque scenario, moved from one cage to another, waiting for his adversaries to determine his fate.